Here is my current setup and experience, I hope it’s helpful to the limited few interested in the topic. Increasing SS beyond a certain point doesn’t make any difference nor does enabling MSAA. Vertical SS resolution should be chosen as a multiple of HMD’s resolution(1440). In order to turn off my main monitor without making it unusable in VD I’m using a DVI to HDMI adapter. The headless display adapters are all HDMI because of availability and offering higher resolution/refresh rates at the time. Turning your head beyond 70 degrees feels uncomfortable so I didn’t go for tripple 4K, a compromise would be to recenter the virtual desktop view instead. The headless display resolution can be adjusted to none standard values with NVidia Control Panel. In order to minimize eye strain contrast settings are maximized and high contrast themes utilized. Also brightness needed to be reduced, unfortunately the slider in VD is without effect once multi monitor is enabled so PiTool is the only option. Computer/sunglasses keep glare in check and you’ll feel the sudden urge to listen to sunglasses at night. Typing in VR is fraught with peril, fortunately the Pimax comes with patented nose gap technology. VR Toolkit would automatically display a feed from the front cameras when looking down with the Vive but marking your keys with stickers in a mock braille fashion helps somewhat. Tap could solve the typing problem and at a mere $179 a pop it’s a steal. Also finally we could get the long awaited sequel to The Typing of the Dead if that tickles your fancy. 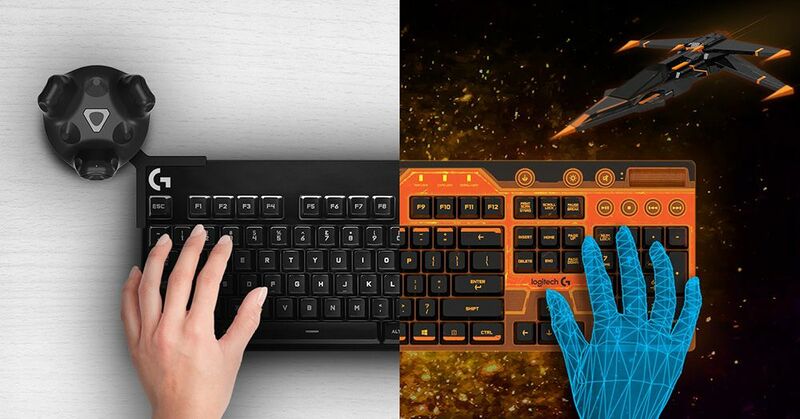 Logitech VR ready keyboard, long awaited but no show. With my settings VD I’d compare it to a 720p monitor, text is easily readable but it’s like an army of ants in motion. It’s great to change your environment on the fly, no moaning about the weather anymore. The choices in the workshop are limited, SteamVR Home would have much more to offer. I’ll give mixed reality a try if I ever come into the posession of a windows headset. The arcane techinique, nose gap, saves the day, again ! With my 8k i used 1.75x SS Pitool + SteamVR SS at 100% and found the text to be quite readable. Thanks for your settings suggestion for the 8K. Text appears to be about the same, probably the 5K’s hardware limit is reached. Legibility also depends on the VD zoom, I’m using 130° with the 4K monitor only. I’m using virtual desktop too. Pitool at 1.5 steamVR at 100 % VD at SS @ 2. Use the built in windows on screen keyboard and text to speech. It’s ok but like you said “it’s like you are looking at tiny moving ants” basically very small jaggies. The resolution isn’t there yet for doing real desktop work but it’s close. I wonder if HP reverb’s will be enough. For TV/movies it’s fine. Also use it for my bike training with Zwift. Could definitely see this being the future, probably more for AR then VR. Could basically replace every screen in your life then. I can only agree, how boring. Cool, I didn’t know about Zwift, if it also sports VR support it’s even more of a winner. Fingers crossed for the Reverb/OJO, waiting for an 8K-X would be tough. I’d add steam controllers or similar(if already owned) away from the keyboard to the list of input methods mentioned by you, just because it’s dual thumb. I prefer VR Toolbox. It has some features and flexibility that I like better. Every time I try to explain why, it turns into a Wall of Text, so I’ll just leave it at that for now. Just note that a lot of flexibility is hidden in the Guides. Thanks, a link to your wall of text would be appreciated. Oh I couldn’t agree more. No other app will pop out floating windows from your desktop. Plus it also has the best post sharpening in my humble opinion. And it opens FAST. That is so key, when your back and forth between vr apps. -displays at native desktop refresh rate. So if you have a fit headless ghost plugged in and set to 90hz, your going to see 90fps video games or video if you use smooth motion project. adjusting the screen angle with grip button and a lot of other qol nuances is like these people unapologetically wanted to make as good an app as possible. No half assery and bonehead design choices in my humble opinion. depth of field and quick window switching to center view. This may relieve eye strain for some. Once again all configurable. a larger cursor as an option, configure how high off the plane of a window it hovers makes it easier on the eyes. if your the type, use from a full library of props and set pieces to make a room to sit in. Done within the app no programming experience or external apps and hours of your time to do it. You can modify it by adding your own objects, plugins or skymaps. I’ve got an app that will allow you to add your own shortcuts to games, documents, movies or webpages (if it can be rendered by Chrome, it will show up in VR as it’s own screen, if not it will pop up on your desktop). Set your VR “Home” to VR Toolbox or anything else, including VD, so that it loads whenever SteamVR does. A few other things. I’ve also created some Skymaps from some Google Streetmaps. Somewhere or other (helpful, aren’t I?) there is a link to some really neat 3D Skymaps that will twist your brain. We’re currently working on adding 3d text and labels. This program gives you the ability to bring in your own " furniture" to map to your existing room, if you’d like, or you can do what I did and loose the room and just have a skymap with a desk and a bunch of floating pages. They are working on adding support for linking to your lighthouse so that your room is always synced. Atm, I use an add in Tracking puck. Support for webcams: put a screen in front of your door to see who’s a’knocking. They just added an “incognito” browser. Support for videos, youtubes, 360’s, all kinds of things. Most can be either given it’s own page in VR, or be pulled off the desktop into VR space. Btw, I"m not actually affiliated with the program. I’ve just been working on some stuff that improves it. Edit: they also support 2d gaming in VR. They even have an injector to keep things running smoothly. Sounds awesome, a lot more features and customizability than VD has to offer. Without controllers I can’t do it justice right now but certainly a topic to be revisited. Actually it works pretty good with a m/k. They have a bunch of hotkeys that you can assign. However, spawning things or moving windows would be a problem, so your usage would be limited, as you say. The closest thing we have to VR focused fitness is ViRzoom. They have a fitness bike and some games. It was fun for a few months but then I out grew it the bike (just a cheap exercise bike not smart) so I moved on. They now have an attachment you can connect to your bike peddles that works with apps for oculus go and quest ( VZfit Explorer app looks awesome. Basically you can bike the world in google street view) but those are not coming to the PC and they do not work with a smart trainer. With the hotkeys I was able to put VTK through some of its paces, thanks. Just setting up your own room doesn’t seem to be possible and for fine tuning assets a controller is required, I’ll try to bring my steam controller back to life. The graphic adjustment options are great, much better than VD. I can see the appeal of decorating your workspace and moving between them. Would be a welcome addition to the pressure sensitive plates and the piranha poodles guarding my lair. Guess we will have to wait for AR displacing smartphones for better fitness apps. VR is just too bulky and limited at the moment. Most gym rats will just watch a show but the market for fitness will be there. Would be great for professional athletes for training. The HoloLens 2 looks pretty good with 2K per eye, only the FOV is laughable. Let’s get controversial, unfortunately at the moment getting text to display perfectly with the P5K isn’t achievable unless using very large fonts. The text is either blury at low SS or the outlines of letters become unstable at moderate to high SS settings. All that is necessary is to run it and test the range of the SS settings in VD. Imo the moderate zone is the worst, less clear and constant morphing, lower settings are best for more stable text and high settings with some morphing but much nicer letters. For people who prefer a more stable image I’d suggest a lower PiTool render quality(0.5-0.75) to fine tune the sweet spot in VD. There are also other factors like contrast, too high or too low exacerbate the problem. why would lower settings be best? Also check the resolution SteamVR is showing. This needs to be evenly divisible by the pimax’s screen resolution or you will get jaggies. But yes even with everything perfect small text will not be as crisp as a real monitor. It’s my preference because the morphing is reduced, the most extreme example is the rainbow effect with the horizontal rulers which is minimized at lower SS. It’s less of an issue with black text on white background. Imo it’s impossible to get rid of the jaggies completely(SteamVR 2562x2559), the P5K’s ppd isn’t high enough, it could be that some of my settings aren’t ideal though. Also check the resolution SteamVR is showing. This needs to be evenly divisible by the pimax’s screen resolution or you will get jaggies. Balancing clarity and sensitivity to viewing angle change via the VD SS setting is still required. Just came here to shout out my mates in the Nose Gap Mafia.